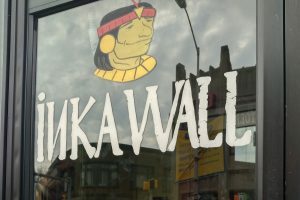 Queer Urbanist Exchange (QUE) is invites you to join our monthly meet up at Inka Wall Peruvian Restaurant (55 Garrett Road, Upper Darby, PA 19082) at 12 pm on Saturday, June 16, 2018 to see Peru play Denmark in the World Cup! The match starts at noon and afterward we will do a tour of Upper Darby. Not interested in watching soccer? Come for drinks and food specials, or join at about 1:45 for the end of the match and the tour. We’ll be checking out some noteworthy Art Deco details in this vibrant community with a vision for the future. Getting there by SEPTA couldn’t be easier as it is only a short walk from 69th Street Terminal!